Seeing as it's Friday, I thought I'd treat you all to this little look at my 'bump'. I'll be 36 weeks pregnant tomorrow... Fern thinks it's hilarious and keeps "ticka ticka ticka" (ie. tickling) my belly at every opportunity. 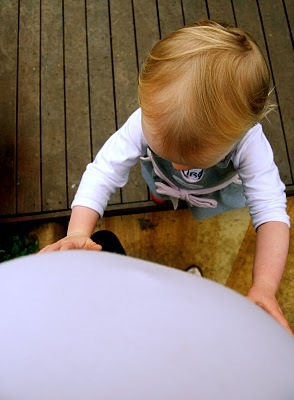 Who knows what an 18-month old baby truly understands, but I know mine has noticed my growing bump and is fascinated by it. If I ask her what's in there, she points to her own tummy and says "bubby!" It seems sort of funny now, reading back on that. To think that at that point, my life was already complete. But of course what I didn't realise was that at the same instant my little son was born, my life was complete AGAIN. That my heart just expanded to replace the deflated tummy as though there had always been room for two. And now of course, I can barely remember it being just Fern and I. Because now it's Fern and Elliott and I. The Three Muskateers. Next month we'll be celebrating my Elli-Boo's first birthday. And what a celebration it will be... for him and for us. Can't wait. I LOVE Elliott's pants! They are too cute! Reading this makes me realise we all feel the same. 8 weeks ago I had my second child and I felt EXACTLY like you...wondering how on earth there was room for my 20 month old plus one more. My heart has expanded beyond belief...it is just amazing.